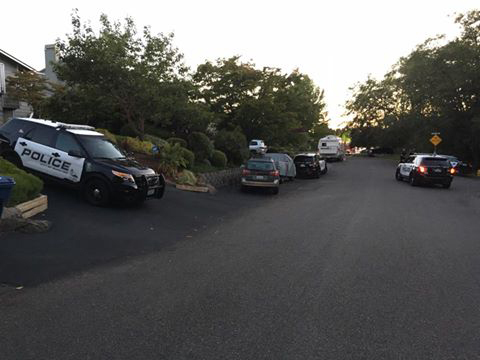 SEATTLE -- A gunman attacked a gathering of young adults at a suburban Seattle home early Saturday, killing two people at a fire pit before firing more shots from the roof, the grandmother of one of the witnesses said. A total of three people were killed and another injured at the Mukilteo property. State troopers pulled over and arrested the fleeing 19-year-old suspect on an interstate more than 100 miles away, authorities said. Police did not immediately release the name of the suspect, but a man named Allen Christopher Ivanov was booked into the Snohomish County Jail on Saturday afternoon for investigation of three counts of murder, including one of aggravated murder, which can bring the death penalty. It was unclear whether Ivanov had obtained an attorney. He was expected to face a court appearance Monday. Gemmer said that according to her granddaughter, the gunman arrived with a rifle at the party of about 15 to 20 friends from Kamiak High School - mostly recent graduates aged 18 to 20. The gunman walked through the house to the fire pit out back, where he shot two of the victims. Those present knew the gunman, she said, and he and one of the victims had broken up last week. Victor Balta, spokesman for the University of Washington, said a student matching Ivanov's name, age and hometown of Mukilteo has been enrolled at the university's campus in nearby Bothell, where he was going into his sophomore year. Authorities did not immediately release information about or the identities of the victims. Officer Myron Travis of the Mukilteo Police Department said local authorities stopped the suspect's vehicle after police shared descriptions with local agencies, CBS Seattle affiliate KIRO-TV reports.